#StayWild Tip: Explore somewhere wild. Check out your nearest park, churchyard or visit a Nature Reserve. I have a number of wild adventures that are on my “list”. The are also quite a few creatures that I would love to see first hand, having only had brief or long – distance encounters. I’ve seen barn owls, badgers and pine marten, but only brief flashes in car headlights traveling to and from work. I would really enjoy being able to spend some time observing these birds and animals going about their business. The same goes for kingfishers – I’ve only ever managed, like many people, to catch a blue blur on a river bank. I guess the trick is having the time to sit and wait, to be patient and become part of the background. It can also be hard to dedicate time to such a single-minded mission when there are so many other interesting distractions along the way! For Day 20 of #30DaysWild, I decided to head to a place I hadn’t been and which seemed like a likely place to spot – at least fleetingly – some interesting and different wildlife from my usual patches. 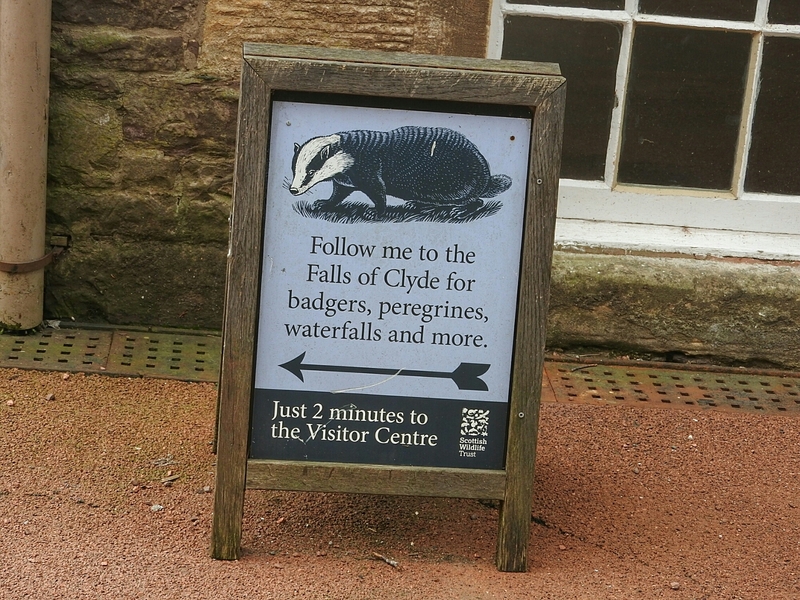 I hadn’t been to the Scottish Wildlife Trusts Nature Reserve at the Falls of Clyde before (although I had visited the heritage site at New Lanark, where the Wildlife Trust Visitor centre is), so I was quite looking forward to the outing. The Wildlife Trust visitor centre was great, with loads of useful trail guides and Ranger logs. There was also some great information about the local bat populations, many of which live in the ruined basement of some nearby castle remnants. I know a lot of these sort of exhibits are aimed at kids, but I can’t help myself – how often do you get the chance to shove yourself inside a giant bat’s head? Sadly, a notice advised that the peregrines which famously nest on a cliff across from the trail had not returned this year, with the suspicion that they had not survived the winter. I hope another pair take advantage of the site as the reserve seems to have done a great job in publicising these charismatic falcons. The trails through the reserve are fantastic. The main trail closely follows the river upstream and offers great viewpoints over some impressive cliffs and gorges. I followed the main red trail, and the riverside parts of the purple and yellow trails, and returned via the blue trail, and with a lot of poking about, exploring and patient watching, the routes gave an enjoyable three hours or so of walking. 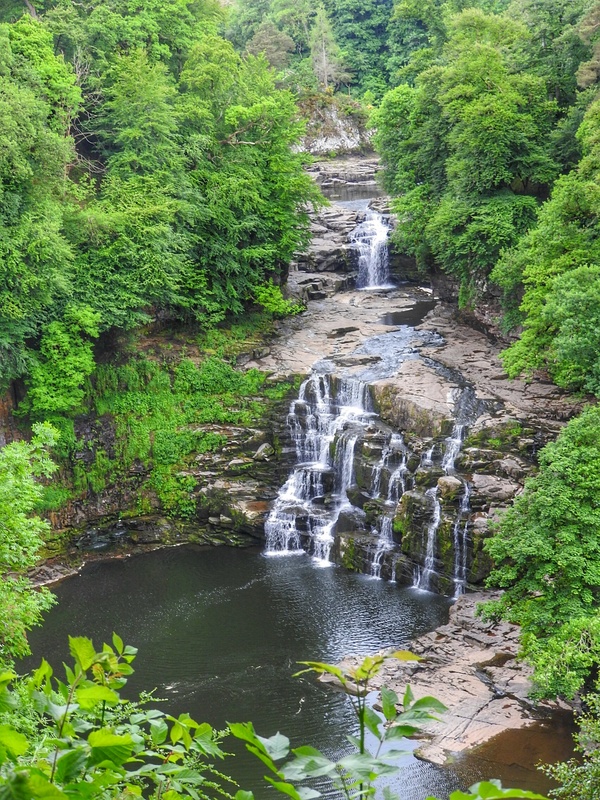 The various waterfalls are on a wonderful scale, especially the Corra Linn and Bonnington Linn. The warm weather of late means the waters were not especially high, but I can imagine how it would look after some good rainfall. I think I would enjoy going back when the river is in spate and full of drama. There was an ubiquitous heron, fishing at the base of one of the weirs. He seemed to be struggling with his footholds! The information on the wildflowers along the route was particularly interesting, with interpretative signs often giving interesting facts and traditional herbal uses, as well as describing their value to wildlife. The insects loved the various blooms, and there were huge numbers of bees and hover flies enjoying them. In fact it was the insects who stole the show for most of the walk, with a wondrous variety, only a few of which I could identify in the field with any certainty (I’m no entomologist). 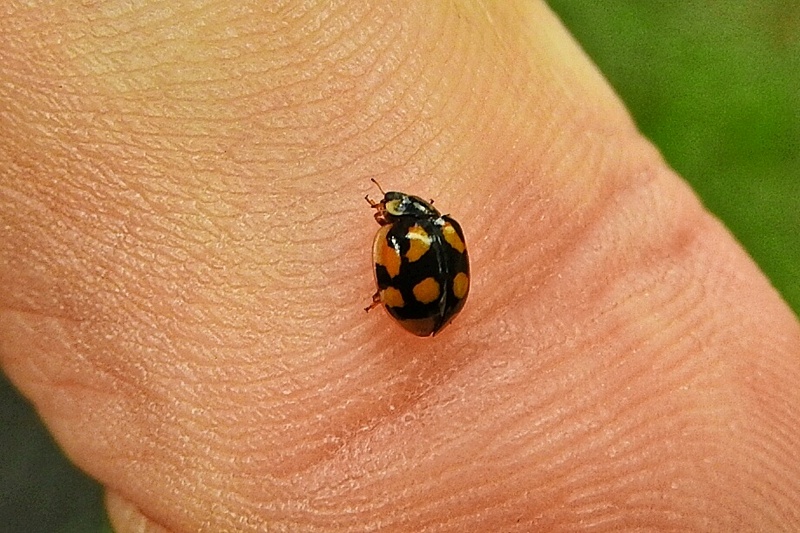 I was confident that this little thing was a Ten-spot ladybird, as she had ten spots. I’ve subsequently learned that the number of spots is no guarantee! I lifted a lot of logs and bark on this walk, and mostly found slugs and woodlice, but this was an interesting find. 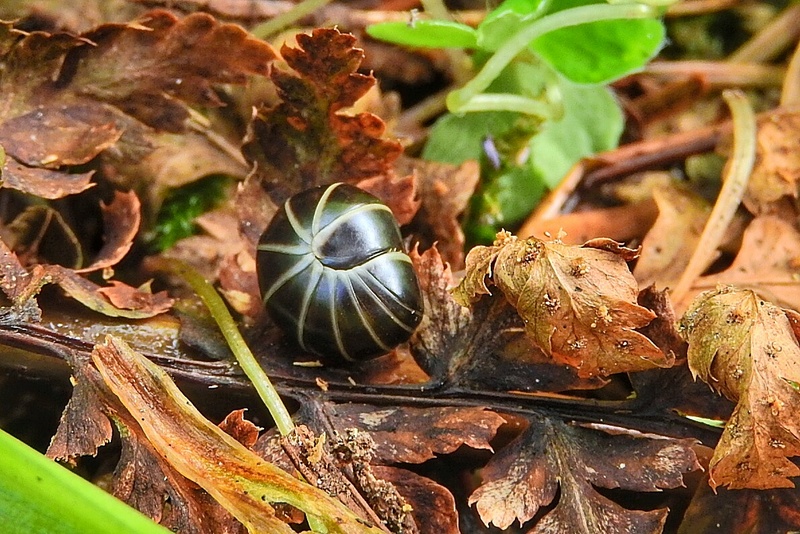 At first I though it was a pill woodlouse (a roly-poly, when I was a kid), but a check in the highly-recommended Insects of Britain and Western Europe Field Guide revealed that it was a pill centipede (with fewer tail segments). I am amazed by how perfectly the segments interlock – what a super example of biological engineering. 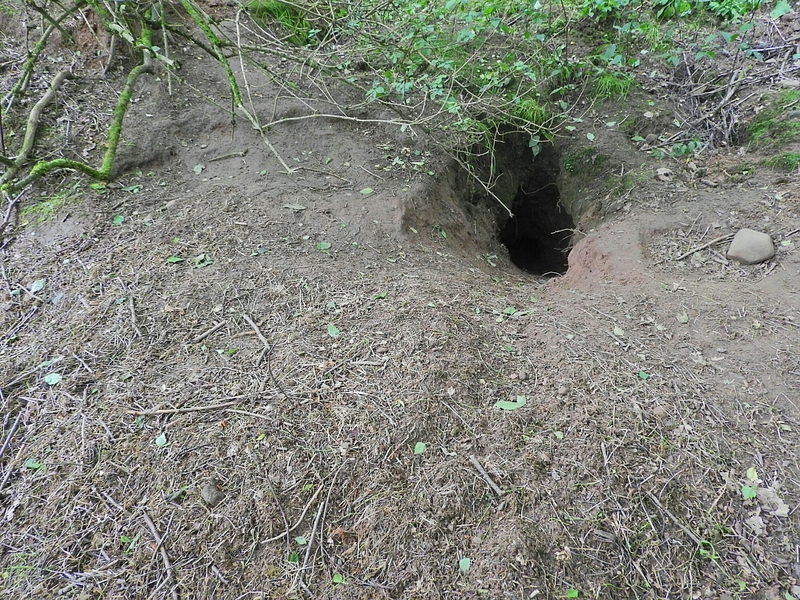 There were huge holes disappearing deep into the soil. Few things are quite so mysterious. I cleared the area quickly so as not to disturb any sleeping underground denizens. This may well be the same set that is visited on walks and safaris by the Reserve Rangers, so I plan to come back soon to join them; maybe then my list will get a little shorter!